Our range of products include pharmaceutical contract manufacturing services, pharmaceutical third party manufacturing service and third party manufacturing pharma companies. 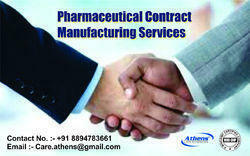 We are providing a wide range of Pharmaceutical Contract Manufacturing Services. Offered medicines are prepared as per the industry standards of quality using only pure quality input factors and modern technology. Keeping in mind the requirements of the patrons, we are offering these services in many options. 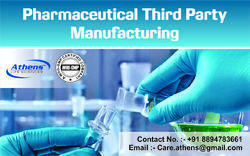 With the support of our adroit team of professionals, we are providing Pharmaceutical Third Party Manufacturing Service. 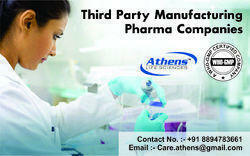 These services are executed using top grade pharma medicines with following industry norms. Also, we offer training and periodical development programs for our new client. Through regular research and development, we are renowned firms for providing a broad collection of Third Party Manufacturing Pharma Companies. Offered services by us are rendered under the strict supervision of experienced professionals as per the industry laid quality norms. Also, these services are rendered as per client need.